Equities have given investors much to cheer across most of Asia in 2013, with China a rare exception. Chinese stockmarket investors may not be feeling the same joy, but Asia-Pacific share buyers have still had much to smile about in 2013. With the “trend being your friend,” are stronger returns ahead for the remainder of the Year of the Water Snake? According to Bloomberg data, as of the close of trade Friday China’s benchmark Shanghai Stock Exchange Composite Index had dropped by 11 percent this year, despite rallying that day on supportive comments from the central bank. With analysts cutting their growth projections to 7.4 percent, below Beijing’s 7.5 percent target, more gloom may be in store for Chinese sharemarket investors amid reports that China is facing its own version of the U.S. sub-prime lending crisis. “Valuations are low and that’s appealing to short-term speculators. But the overall trend remains downward as the financial system is still in a money crunch that may hurt economic growth,” Central China Securities strategist Li Jun told Bloomberg News. The Shanghai bourse dropped 14 percent in June for its worst monthly performance since August 2009. This year’s dive has also seen Chinese companies exit the top 10 list of global companies by market value, as noted by The Diplomat. The Hong Kong market has felt the spillover effects from China, with the Hong Kong Hang Seng Index down nearly 6 percent this year, while nearby Singapore has scrapped out a mere 1 percent gain in 2013. South Korea has seen its stockmarket drop 6 percent on weaker growth, with industrial output contracting. However, on Thursday Seoul upgraded its growth outlook for 2013 to 2.7 percent, up from 2.3 percent, with monetary and fiscal stimulus expected to boost Asia’s third-biggest economy. However, the standout performer among Asia’s major markets has been the Nikkei Stock Average, with a 33 percent gain for 2013. Buoyed by the Bank of Japan’s record asset buying – twice the size of the US Federal Reserve’s, in GDP terms – and a resulting weaker yen, foreign investors have poured money into Tokyo stocks. 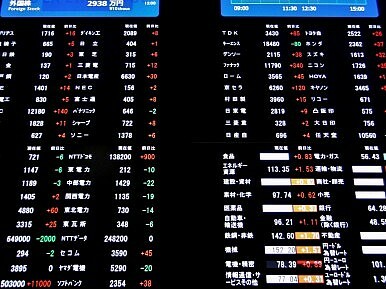 Yet after peaking in May north of 15,000, the Tokyo bourse has retraced much of its gains, closing at 13,677 on Friday. Still, according to the Nikkei Shimbun, foreign investors have purchased a net 10 trillion yen of Japanese equities over the past six months amid hopes of an end to deflation. With Japanese industrial output rising 2 percent in May – well above the forecast 0.2 percent gain – and housing starts expanding for the ninth straight month, “Abenomics” appears to be starting to impact on the real economy also. Meanwhile, despite a slump in commodity prices Australia’s sharemarket has posted its biggest annual rise in six years, returning over 17 percent in the 12 months to June 30 and a 6 percent rise for 2013. However, it has been a divided market for investors, with healthcare, information technology and telecommunications stocks soaring but miners diving. “Global markets have risen aggressively off the back of additional stimulus despite the fact that earnings growth has not been particularly strong,” Perpetual’s Matthew Sherwood told the Australian Financial Review. Across the Tasman, it has been an even better story for the New Zealand bourse, with its benchmark index surging 30 percent over the past year and 9 percent in 2013. Elsewhere in the region, only the Karachi bourse has come close to matching the Nikkei’s advance, with Pakistani stocks posting a solid 29 percent gain in 2013. The rise has far outpaced that of neighbor India, which has seen its stockmarket tread water as its economy posted its slowest growth rate in a decade. Investors in other South-East Asian markets have also had reason to celebrate, with the Vietnamese market climbing 19 percent, and the Indonesian and Philippines exchanges both posting 13 percent gains in 2013. Are more gains ahead? According to Bloomberg data, the MSCI Asia-Pacific Index is currently trading at 12.5 times average estimated earnings, below the 14.6 times of the U.S. Standard & Poor’s 500 Index or the 12.7 times of the Stoxx Europe 600 Index. Should Asia’s growth performance remain robust, the valuation gap with other major markets should help spur further rises in Asian equities, although going “long” Japan and “short” China has been the standout play in 2013.